The candidates running for the Palo Alto Unified School District Board of Education prepare to answer questions from student journalists and the community. From left: Stacey Ashlund, Ken Dauber, Shounak Dharap, Kathy Jordan, Alex Scharf. 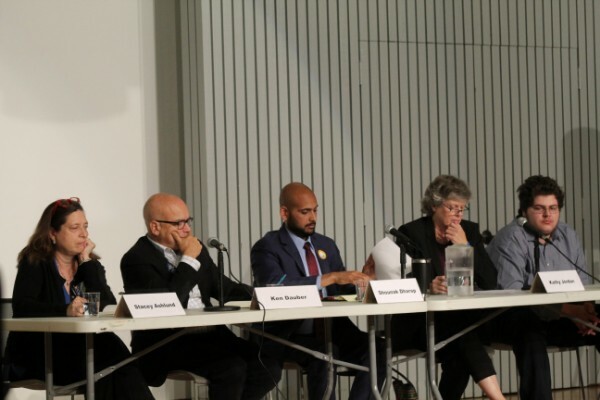 After a community forum hosted by the Palo Alto Weekly on Thursday at the Palo Alto Art Center, one thing is clear: each of the candidates for the Palo Alto Unified School District Board of Education is looking to bring big changes to the district. Board candidates Alex Scharf, Kathy Jordan, Shounak Dharap, Stacey Ashlund and incumbent Ken Dauber were present at the forum. 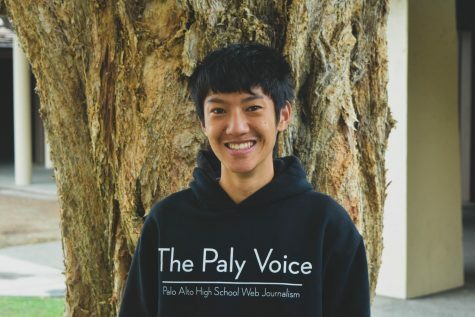 According to the forum’s moderator, the Palo Alto Weekly had asked board candidate Christopher Boyd to withdraw from the forum after a Weekly investigation found he misrepresented his afterschool science program, InSTED. During the first third of the forum, the candidates answered questions from the Weekly. One question probed the candidates’ ideas on solutions to Palo Alto’s achievement gap, which Smarter Balanced test results in 2017 indicated was still present. Dharap said that for a public school district, providing education to all students regardless of socioeconomic status should be a high priority. Dauber expressed agreement, noting that the achievement gap stands as evidence that there is still room for improvement in terms of educational equity. Weekly editor Jocelyn Dong next asked the candidates about challenges the Palo Alto community still faces in maintaining youth mental health. Ashlund said that involving students in mental health education from a young age would be a first step. Scharf said that overcoming the stigma surrounding mental illness would also help the district handle students’ mental health concerns more effectively. During the second part of the forum, student journalists from The Paly Voice, The Campanile, Verde Magazine and Gunn High School’s Oracle approached the microphone and posed questions to the candidates. Paly senior Ujwal Srivastava, an editor-in-chief of The Campanile, asked the candidates how they would improve transparency in the board’s decisions and processes. Ashlund said that as a board member, she would make sure that the board waived the two-meeting rule less often. Under the two-meeting rule, board members spend one meeting discussing and hearing information about items on the agenda and the next meeting during the subsequent week voting on them. Dauber said he had supported transparency as a board member but didn’t think that the two-meeting rule had an effect on transparency. Scharf said that to increase transparency, the board should make sure that meeting minutes are clear and accessible. In response, Jordan said that if elected, she would want to maintain a good relationship with the student press, but that the latter should maintain standards of professionalism and truthful reporting. Ed Code 48907, part of the California Education Code, states that students have a right to express freedom of expression as long as the expression is not obscene, libelous, or slanderous. Dharap said that as a board member, he would emphatically support press freedoms. 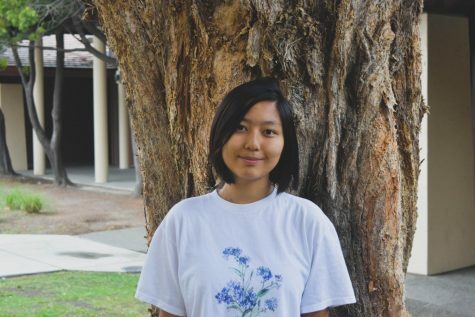 Senior Kaylie Nguyen, another editor-in-chief of The Campanile, asked the candidates about their thoughts on the process behind the yearlong creation of Palo Alto High School’s new bell schedule in 2017, which was quietly replaced by a new schedule over the summer after it was found to not meet the state standard for minimum instructional minutes. Ashlund responded by saying that the schedule creation process needed to be smoothed out. Jordan also said that the board had erred in the schedule making process, in that an auditor had mistakenly reported the new schedule as being compliant when it was actually 21 days short in terms of instructional minutes. The third segment of the forum consisted of questions from the audience targeted at specific candidates. To save time, the moderators directed each question at two of the five candidates. One question, posed by a Paly student who did not give their name, asked the candidates how they would make students feel safe on campus in the wake of the sexual assault incidents in 2015 and 2016. Dharap said that focusing on compliance and culture would be the first steps toward safer campuses. Jordan agreed, saying that student safety was a priority of every board member. Election day for the Board of Education is Nov. 6.